In the game of life we are not all dealt the same hand, but the odds of survival into adulthood - at least in the developed world - have generally lengthened with the passing years. Although the awful toll of infant and child deaths was reducing by 1913, the life expectancy of a male child born in that year in England was well under sixty years. The subject of this biography, however, died in his ninetieth year; but when he was a child he seemed destined not to live beyond adolescence and to enjoy a long and richly fulfilled life. The birth of a male child to parents Thomas Lewis and his wife Winifred Mary (née Hudson) was registered in the Stockport Registration District in the fourth quarter of 1913. In actual fact, the birth was on 23 August and took place at Marple Bridge. The name registered in the official index of births was Kenneth Lewis; but to that we must add another forename: Cyril. And we can immediately discard it, because this child was to become somebody known to several generations of bell ringers as C Kenneth or C K Lewis. To many he was simply Ken. In an age of greater deference he was always addressed as Mr Lewis by the young, some of whom have gone on to become eminent ringers in their own right, and they will feature in the peal record of these pages. The child was not robust and when he was still in his early teens a very serious attack of pneumonia threatened to end his short life. He recovered but it was not expected he would live long. Yet, displaying a vigour and determination to succeed even at that relatively tender age, he defied the unlucky roll of the dice that came his way and pulled through. Soon he was entering employment in Manchester, in the office of the Vice Consul for Uruguay. He could have pursued a brilliant academic career, as he had already shown he was capable of passing the entrance examination to the grammar school, but he refused to sit it. Nonetheless, he was capable of serious study. He rapidly progressed in his place of work, learning commercial subjects, accounting and Spanish at night school. The sharp brain, diligence and determination remained and stood by him throughout the long years that followed. He was always slight of build, but heart, spirit and mind stayed strong. He eventually came to be closely involved in the control of exports to Uruguay and Argentina. No doubt this might have continued, but soon after the outbreak of the Second World War he was called to serve his country. His service was in Meerut in India. It was after demobilisation, however, that he found his true vocation. 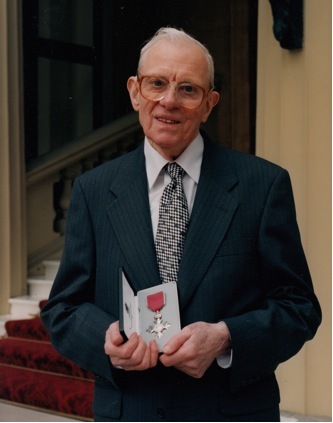 Taking mathematics as his special subject, he undertook an intensive year's training at Padgate College in 1947. This was in connection with the Government's Emergency Training Scheme for Teachers. It goes without saying that he emerged as a very talented young teacher, and he began his career in St Mary's Church of England Primary School, Stockport. It would not be long before he became a head teacher. The school was St Margaret's School, Altrincham. Thus began the association with the town and its community, an association which stayed strong until the very end. In 1968, when the three Altrincham primary schools amalgamated, Ken became the head of the combined school in its new building, and a most accomplished one indeed. He retired in 1978, but no beslippered rest ensued. He remained very active, and one activity - that of room steward at Dunham Massey Hall - was something to which he devoted much energy. Ever the teacher, he delighted in showing school parties the history of the house, taking the role of a Victorian butler. "Behind every successful man..." All can complete the oft-used phrase, but in so many cases it proves to be true. It was in 1948 that the marriage between Cyril K Lewis and Mary Elkins is recorded in the church of St Mary, Bowdon. 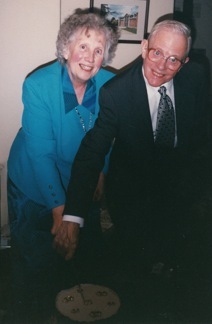 Ken and Mary set up home together in Altrincham, eventually at 52 Wellington Road. They had one daughter, Kathleen; and later two grandchildren, Philip and Helen, joined the close-knit family circle. There can be absolutely no doubt that Mary was a tremendous support to Ken over their fifty-four years of marriage, and that the home they set up together was a source of great strength and comfort. Mary, who is happily still with us, has herself a distinguished ringing pedigree. 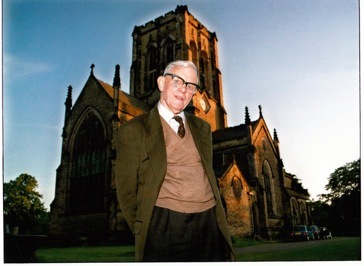 Her father, A Richard Elkins, had been Chester Guild Master in 1967, and he is commemorated in the Addleshaw Tower, Chester: his name appears on the original Archives cupboard. But the ringing career cannot wait much longer. He did much at St Margaret's too, of course. He was responsible for the rehanging of the ten bells in 1974; they still remain challenging. Ken became tower captain in 1958 and over many years taught countless people to ring. He took a particular delight in helping learners to progress. His service to the tower was exemplary, and cannot have been emulated by too many ringers. Sunday service ringing or practice nights were not missed, unless he was away at the Central Council or on Guild business. Even though Ken was 80 when this photograph was taken, it strikes a pose that will be familiar to very many people who rang with him. He was born, then, in Marple Bridge, and later the family moved to Marple village, where Ken's association with All Saints Church and its bells began. 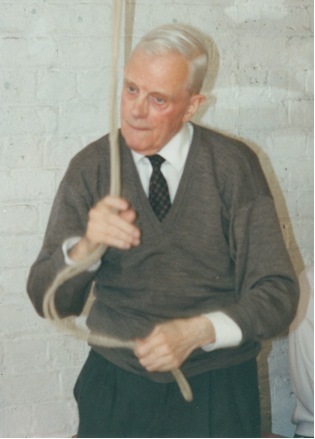 It was in 1932 that he learnt to ring, Arthur Whiting having played a major part in the teaching. Marple was a stony tower in those days, but Ken was soon able to introduce change ringing, albeit not without some determination. He did not have to go far to find strong centres of ringing, although it must not be forgotten that this was not in a car or even always on a bus. He soon began to visit Disley, a few miles distant, and came under the influence of James Milner, who introduced him to the wonderful world of Spliced Treble Bob Minor. Another tower, not too far away, that had a strong influence on his development was Norbury (Hazel Grove). The name Fernley stands out in this place, which later was to become a by-word for excellent and progressive eight-bell ringing in the North-west of England, in the thick of which stood, of course, C K Lewis. It was here, in 1923, that the first peal in 35 Treble Bob methods had been rung, conducted by James Fernley, senior. Ken embraced this world with great enthusiasm, and it would not be long before he too was breaking all the records. If he had a rather uncertain start in life, his peal-ringing career too stuttered into existence. It took no fewer than thirteen attempts before he eventually rang a peal. This was in three methods at Knutsford on 5 May 1934, and the conductor was Sidney Hough, senior. Fifty years later, three of the original conductor's sons joined Ken at Knutsford for a repeat performance. The intervening years had seen a career of great distinction, and it did not stop there, as another 300 peals were to follow. In 1939 C Kenneth Lewis featured in the Ringing World as Leading Conductor No. 69. The term 'Giant of the Exercise' has been used, possibly misused, to designate notable ringers of the past. Undoubtedly there are practitioners of the art of bell ringing today who demonstrate exceptional talent, and such ringers will continue to people our belfries. It might seem odd to some to add the tag of giant to this diffident and unassuming man of relatively small stature, yet Ken Lewis was without question one of the greatest ringers of his generation. As George Lee wrote, in his obituary in the 2003 Annual Report of the Chester Diocesan Guild, Kenneth Lewis was 'truly a gentle giant of the exercise'. After that first stumbling step, Ken rapidly progressed as a ringer of peals. There can be no doubt that his association with John Worth of Macclesfield, which began in those days well before the outbreak of World War II, became a very significant factor in his development. John too was a most renowned ringer and it was he and his peal band in the post-war era that were to set such high standards, until John's untimely death in 1967. John and Ken quickly became a team, both understanding each other perfectly. In the 1930s there was a rivalry between the Cheshire ringers and those in Lincolnshire to ring as many Minor methods as possible in seven extents. They went down different routes: the Lincolnshire peals also including Plain and Alliance methods. The Cheshire ringers concentrated on what we nowadays should call treble-dodging methods. Ken established contact with A G Driver, and began to use his tables to arrange ever more intricate extents. The culmination of all the band's endeavours was reached on the then six bells of Fairfield in 1937, when 73 methods were rung. The story of the very brief discussion at the foot of the stairs when John told Ken he was happy for him to call the peal, as he knew it so well, is perhaps not familiar to many today; but it is indicative of the close bond between the two ringers. We can be quite sure that they both knew exactly what all the other bells were doing throughout, and that this record - which stood for many years - was thoroughly deserved. Thus, in these early years we see the emergence of not only an extremely competent ringer but also an excellent conductor. The composer too had seen the light of day by then. Somewhere in the correspondence with other members of the Central Council Methods Committee, he wrote that he considered the construction of an extent of Minor to be true composing, as there were only 720 changes available. Much later, Ken was able to push the 73 methods up to 74, and he called the peal at Marple in 1983. We must not forget the handbells. The start was again tentative: Bob Doubles at Marple in 1938, but it was a local band. At the beginning of the war, before he was called to go abroad, he was posted to Preston, and there began a friendship with Cyril Crossthwaite. They rang several handbell peals together. The peal record contained in this volume has a large number of handbell peals - indeed his very last peal was in hand (November 2001, conducted by himself) - and he called many. David Atkinson, one of the Chester Guild's foremost handbell ringers, mentions in The First Hundred Years (the history of the Guild, much of it written by Ken, incidentally) how Ken conducted 'with great skill' between 1978 and 1983 a series of Spliced TB Minor peals, culminating in one in 42 methods. Prior to that he had rung in peals of Spliced Surprise Royal in four and seven methods in 1969. In the same year he rang Kent TB 14 in hand. It is not easy to pick out all the examples of his fine performances as a ringer of peals, as there were so many. He was in the band that rang the then record length of 21,600 Bristol Surprise Major at Over in 1950; and in 1951, at Worsley, he rang 15,840 Cambridge Surprise Royal. He also called 13,440 changes of Spliced Surprise Major at Hazel Grove in six methods in 1961, only two weeks after the composition had been published. The record includes some silent peals, one of which was the famous peal in four Surprise Major methods by A J Pitman. Then there were the Spliced Surprise Maximus peals between 1966 and 1970, the last one being in 110 methods. The peals in this book tell a story of excellence, a story of which he, and all of us who have come after this gentle giant, must be immensely proud. Many ringers in these performances, starting in their peal-ringing careers, have now become very well known, but they will all owe much to Ken for the inspiration he gave them. A good number of peals, however, are quite simple; but they will include those which helped other ringers, often young ones or those of more modest ability, to make progress. There is in the 2000 plus peals in this book the first of Cambridge Major by this writer. The band which rang the 21,600 Bristol. 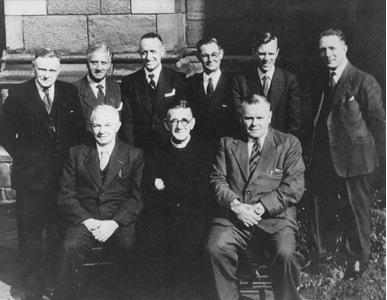 front row: John Bibby, Revd John Kingdon, John Worth. The photograph was taken in 1958, after a peal at St Mary on the Hill, Chester. If 'Giant of the Exercise' is too easily applied, then so is 'legendary'. Nonetheless, nobody who rang regularly in peals with Ken would ever forget the voice. Calls not to be missed, they simply could not be. And it is equally well known that he very often viewed the circle from the fifth bell. Yet nothing must detract from the clear fact that he was an excellent conductor and seldom faltered He called the first peal of Londinium Maximus in 1959, and that of Brigstowe Maximus in 1961. He called Spliced Surprise Major peals by Pitman in an increasing number of methods in the 1950s. His mind was razor-sharp and he had the wonderful ability to know what all the other bells were doing. All those many ringers who rang with him, from the likes of Ted Jenkins (another 'legendary' character) to legions of 'up and coming youngsters', could testify to that excellence. Some later became first-rate conductors themselves. In 1958 on a Friday morning at Hazel Grove, Ken conducted Pitman's five-part peal of thirty Spliced Surprise Major methods. Then on a very bumpy bus ride to Macclesfield he wrote out, from memory, complete with coursing orders, the same composer's one-part peal of four-spliced all the work, he checked his manuscript against the printed composition and called it effortlessly in the afternoon at St. Peter's, Macclesfield. These performances brought no special mention in The Ringing World. It was all in a day's work to Ken. His home at 52 Wellington Road was a secure base and one of familial warmth. It was also a venue for handbell peals, after which the band would be well fed and watered by Mary. There was, however, one room reserved for Ken's own use. This was a little room at the top of the stairs. After his death, when many papers destined for the Chester Guild Archives were perused and sorted, this room held much of the history of ringing in Cheshire and the North West. There was the typewriter on which the voluminous correspondence with the Methods Committee had been composed, and here were countless scraps of paper, often accompanied by drafts of letters. Ken would always try to help ringers throughout the country with their requests for compositions. His replies were prompt and everything was worked out by pencil and paper. The name of C Kenneth Lewis will long survive as the composer of several peals. It will be known by all those who study the Guinness Book of Records, because it was he who composed the peal of 40,320 Plain Bob Major rung at the end of July 1963 - and conducted by Robert Smith - at the Loughborough Bell Foundry. There are two classics, which are frequently rung. One is the first modern peal of London No. 3 Surprise Royal, and is to be found in The Ringing World Diary. The other is much rung by handbell ringers, and is a peal of Bob Major. And as a representative of Ken's 'true' composing, there is a very good extent of Plain Minor in 7 - 19 methods, with a plain lead of every method included. The one given here is in 19 methods, and is quite a challenge for the conductor - and the band. Also true to Yorkshire, Lincolnshire, Superlative No. 2, Pudsey and Rutland. Repeat three times. Singles halfway and end. Yet it was not just as a highly distinguished ringer that Ken must be revered. His service as tower captain and teacher of ringing has already been mentioned. He also faithfully served the Chester Diocesan Guild in various offices. It was not long after he became a ringer that he was elected - in 1934 - to the post of Secretary of the old Bowdon, Stockport and Mottram Branch. He held the same post in its successor, the East Cheshire Branch, and retired from it in 1978, after an amazing 42 years. Along with Mary, from 1948 to 1971, he produced the Annual Report. He also served as Master, 1970-73, and he was a Lay Vice President from 1979 until his death. At Guild business meetings he spoke with authority and conviction, a much-respected voice. The same came be said about his speeches at meetings of the Central Council of Church Bell Ringers. He was elected to that body, as a Guild representative, in 1948, and served for three years; but then he became an honorary member and served on the Council until the year of his death. He never missed a single meeting. He was an esteemed member of the Methods Committee 1948-1975, and 1981-2002. He was elected a Life Member in honour of this wonderful record of service to the Exercise. A delightful photograph, very typical of Ken, taken on the occasion of his 80th birthday in 1993. I have seldom met such a selfless and dedicated man, who thoroughly deserves to be honoured for years of devotion and Christian service. A richly deserved MBE, awarded in the New Year's Honours List, 1997. I am grateful, above all, to Mary Lewis for much of the information above written, and for correcting my errors. She has also been able to lend some of the photographs. Any mistakes that remain are mine, and mine alone. I have made much use of the obituaries of Ken by Brian Harris and George Lee; and the contributions of Bill Dowse and Peter Dyson, which are printed on the Chester Guild website. The file of material that was assembled in connection with the award of the MBE, and now in the Chester Guild Archives, contains material which has also helped me in the writing of Ken's biography, notably contributions by Cynthia Warrilow, the Rev. Max Ramsay and Carolyn Haworth. The photograph, taken outside St Margaret's Church, Dunham Massey one summer evening in 1996, is by Pauline Neild. It is a particular favourite of Mary's, and I can fully understand why. It says much about our subject. The somewhat grainy photograph of a much younger man than most of us will remember was taken from the DVD of the Ringing World, 1911-1940. The photograph of the band that rang the then record length of Bristol at Over is well known, and there is a copy in the Guild Archives. It was taken eight years later, after a peal at Old St Mary's, Chester. The peal is commemorated on a peal board at the base of the tower, as it marked the retirement of the Revd John Kingdon. Apart from the reverend gentleman, every ringer of the (exclusively male) band wears a tie and a suit. Much has changed over the years in the world of church bell ringing - not everything for the better - but the 1950 peal was a remarkable performance by remarkable ringers. As for the main object of the production of this volume - the printing and binding of Ken's peals - several people have made a valuable contribution. First of all, Andrew Craddock of PealBase, who also rang in some of Ken's peals, has worked tirelessly to assemble them all. Throughout the process he has offered helpful advice. I must also thank Bill Dowse, Helen Foster and Kevin Rogers for sitting down with me one afternoon in the tower of St George's, Stockport in order to extract the peals rung before 1950 from bound copies of the Ringing World. Of course, the only 'definitive' list of all Ken's peals available was the one produced by Mary, and its neatly written pages have been of much help to us. Proof-reading is not something relished by all, but I am extremely grateful to Brian Harris and Michael Orme for sharing this task. We must also thank Edward Leetham of Nantwich for the printing of the peals, and Andrew Brown of the Artisan Bindery (Great Barrow) for producing this handsome volume. Helen and Kevin have also given me valued support in the final choice of material. It is well known that Ken did not keep proper and thorough records of his own ringing performances. With prolific ringers there comes the inevitable moment when a significant number is about to be recorded in the ringing annals. Ken himself must have been aware of the 50th and 100th, and both duly appeared with an appropriate footnote in the Ringing World. Both were one out, but that was not Ken's fault: a false peal - subsequently removed - was in the total. Mary it was, however, who compiled the list of peals which led to the footnote marking Ken's 1000th peal. That peal - one of Spliced Surprise Major in 12 Methods rung at Hazel Grove in 1969, and no. 1001 on PealBase - might not have been the 1000th, but it is of little consequence. It is very close. Inevitably, with the passing of the years, and given that the peal record has been compiled by human hand - not by a machine - mistakes have crept in. Not many, and we must thank Mary for her very careful work in putting everything together. Without her list of peals the task of putting the final touches to the peal record of C K Lewis would have been very much harder. A definitive total has been reached and agreed. It might be very slightly out; but that hardly matters. The list of peals contained in this volume makes fascinating reading. JDA Sunday, 15 September 2013. Note: This biography accompanies the book of peals presented to Mary Lewis by the Guild on 24 August 2013.